When you need car body repairs in Cadnam, Southampton, look no further. At Cadnam Garage Services we promise to offer you the best service at an affordable rate. 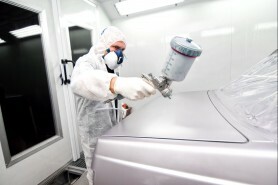 We don’t believe that you should spend hours searching only to find that you spend a fortune on your car body repairs. Whether you need the paintwork repaired or the entire side of your car replaced, we offer competitive quotes at a high standard. Cadnam Garage Services understands that your car is your pride and joy. We work on many types of car body damage, whether you have a couple of scratches or dents in various parts of the body work, or significant accident damage. Cadnam Garage Services will explain the process to getting your car back on the road. We only employ the best. Only our expert staff will work on your car body repair work to make sure it is completed to the highest standard. We can work on many different makes and models and will only use genuine parts, paints and body panels to suit your car. If you have any questions about the work, our mechanics will be happy to answer them. At Cadnam Garage Services, we offer competitive prices for car body repairs in Cadnam, Southampton. If you would like a quote, please give us a call today and we’ll be happy to help. Cadnam Garage Services is here to help with your bodywork repair. Contact us today for more information or a quote.